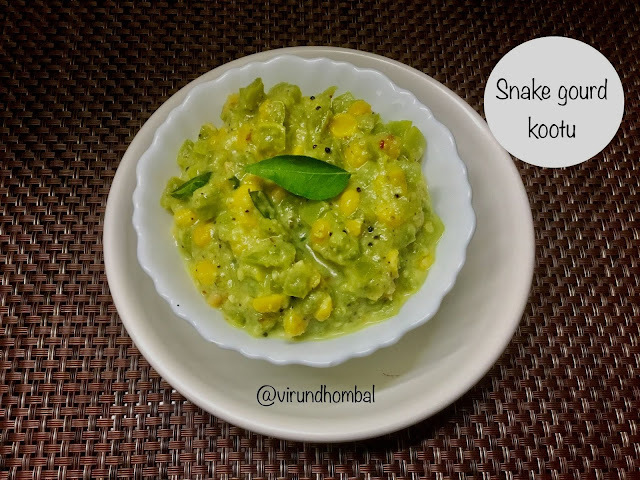 Snake gourd kootu is a healthy side dish for your lunch. We have a wide variety of high water content vegetables like bottle gourd, ash gourd, snake gourd, ridge gourd etc. All these vegetables contain eighty percent water and keep you hydrated the whole day. These water content vegetables are a popular choice for kootu, sambar and thayir pachadi. Try to include any one of these vegetables weekly, twice in your regular diet. Snake gourd kootu is a wonderful side dish for pulikuzhambu. 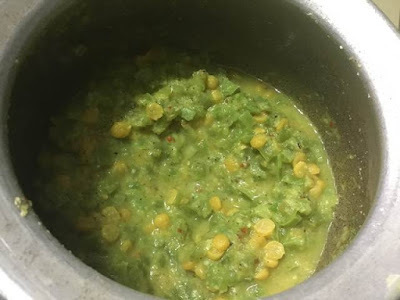 Kootu is often prepared with moong dal or toor dal. But for this snake gourd kootu we add chana dal. I like the crunchy dals in the kootu which adds a beautiful colour also. 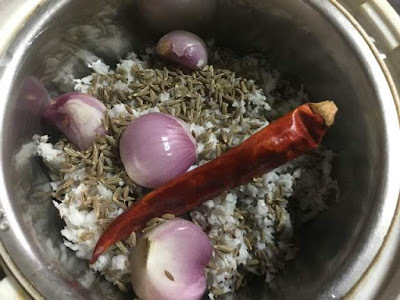 Most of our kootu or poriyal dishes we add the ground coconut paste, which adds flavour, colour and taste also. Wash the snake gourd and slit them and remove the white pith completely. Cut them into small cubes. Pressure cook the chana dal. Grind the grated coconut, small onions, dried red chilli and cumins with little water. Take a deep vessel and add the chopped snake gourds along with 1/2 cup of water. 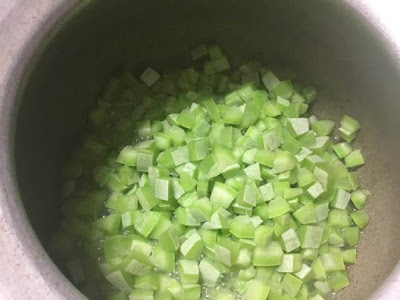 Cook the snake gourds on medium heat.Stir in between and cook the snake gourd until soft. When the snake gourds are cooked well, add the cooked chana dal and mix well. Next, add the ground coconut paste and required salt. 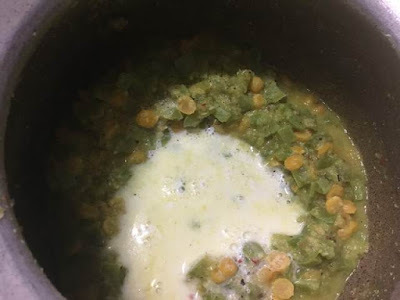 Mix them well and add the turmeric powder and allow the kootu to boil for 7 to 10 minutes on medium heat.When the raw smell of the cumins disappears, turn off the heat and add the milk. Heat oil in a small pan and add mustard and urid dal. When it splutters add the curry leaves and add it to the hot kootu. 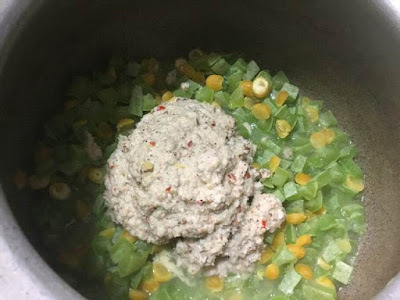 Mix them well and transfer it to the serving dish. Wash the snake gourd and slit them lengthwise and remove the white pith completely. Cut them into small cubes. 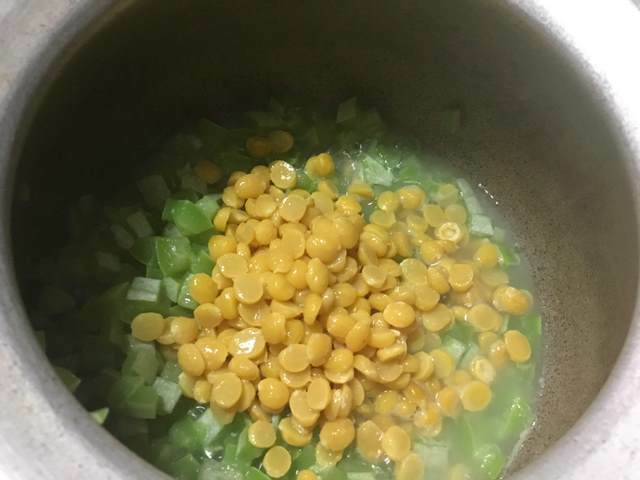 Pressure cook the chana dal separately. 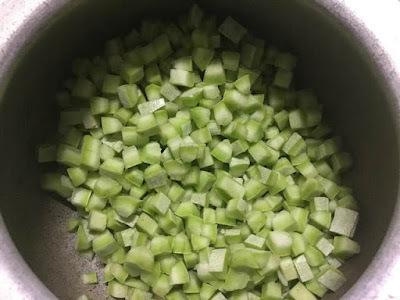 Take a deep vessel and add the chopped snake gourds along with 1/2 cup of water. Cook the snake gourds on medium heat. When the snake gourds are cooked well, add the cooked chana dal and mix well. Next, add the ground coconut paste and required salt. Mix them well and add the turmeric powder and allow the kootu to boil for 7 to 10 minutes on medium heat. When the raw smell of the cumins disappears, turn off the heat and add the milk. If the kootu appears thin, add a teaspoon of rice flour and boil for a few minutes and turn off the heat. When it splutters add the curry leaves and add it to the hot kootu. Mix them well and transfer it to the serving dish.